This is part 2 of 10 of the Survival Shooter tutorial, in which you will setup and code the player character, as well as create an animator state machine. beboping and doing all that stuff. there we go, Player, it should be right there. So we'll just click and drag and drop and there he is. There he is, looking pretty swag. the position is at (0, 0, 0). which will put it where ever we want it to be on the origin. interact with the player in a very special way. when they've come in contact with the player. here in the inspector and it currently says Untagged. and we are going to select Player. behave appropriately when they are playing. and I'm still zoomed in here. which we'll just click on right here. animations that we've setup first? the preview window in the lower right of the editor. in what we call a generic manner. So if I look at my rig you can see generic up at the top. bone structure because our character is going to move like this. It's going to be kind of hopping around. So he's not got two arms, two legs as a biped would. are a move, an idle and a death. animations are going to be played back. work later, so just look but don't touch. it's actually magic, we hired wizards. create this asset that's going to allow us to do that. Create and then Animator Controller. Player AC for Animator Controller. because Player itself will become highlighted. component, Player AC, right there. That's how I know I've done it correctly. which is automatically going to open up the animator window. tab, dragging it and docking it in to the window. those animations that were baked in to those settings. Those actually create assets that we're able to use. and again look at my player.fpx. we're going to reorder them in just a moment. and a Death state and an Idle state and a Move state. Orange means that it's the default state. It's a sad game but it's not that sad. So that will then turn orange. So we've got these three states, idle, move and death. to the next isn't currently in here. and we have this little + icon right there. and we're going to call this IsWalking. like I just did not. lowercase s, capital W alking. which you really don't want to do. Trigger, and a trigger is like a boolean. it sets it back to false. trigger something to happen one time and then it resets itself. We listened to a lot of heavy metal while making this. to move us from one to the next. and 'this state is capable of going to that state'. because that doesn't make a whole lot of sense. we go from one state to another. and I'm going to select Make Transition. and it's going to connect the two. So now what we have is a transition from idle to move. See, there you go in case you didn't believe me. can go from idle to move. I have to click on the transition. the transition between the two. is down on the bottom we have these conditions. What is the condition of this transition? and I'm going to leave that as true. from the move state back to the idle state. So if the player is walking we play the walking animation. we play the idle animation. this time we want the player to be able to die. So we are going to use the Any state. I don't mean you're going to transition from any state you want. So the one that says Any state. you're currently in if you die, you die. we immediately switch in to the death animation. is to give him a physical presence in the scene. then you can select the player. We're going to add a rigidbody. 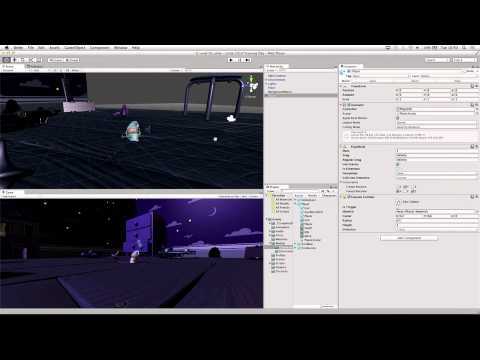 the physics engine of Unity to be applied to the object. INF in the drag box and hitting return. firmly grounded, despite this being a dream sequence. or jump up or anything like that. and Freeze Rotation X and Z or Zee. You'll have to expand constraints if it's not currently expanded. all the other colliders there. so we make sure that the capsule covers the player. capsules going to cover him nicely. a little yelping sound when he gets hurt. you can see Player Hurt there. will also close the window. to it just so that we can see the ones below it. when you start the game it'll go 'oh'. and uncheck Play On Awake. and that's in the Scripts - Player folder. hand side the different player scripts that we've got. You can assign a script a number of different ways. up and drop if on to the player game object. as a component at the bottom of the list. too because we're in the beta software. you should get mono develop to come up. There's a number of different ways to open a script. at the top of the inspector. of early braces, or brackets? that we can adjust throughout the course of class. We're always going to start off with our public ones at the top. and then underneath with private ones. going to control how fast the player is. I'm going to give it a default value of 6.
saying that this is a floating point variable. Now we move on to the private variables. but I don't, I want a vector3 type of variable. you'll remember that it does it the other way round. the movement that we want to apply to the player. and we'll call that Anim. and we'll call that Player Rigidbody. called Floor Mask, now I'm going to explain this one. a layermask, which is stored as an integer. at all, just hit Convert, everything will be fine. and we're going to give that a value of 100.
the script is enabled or not. So it's good for setting up references and things like that. of the layer that we're going to get. on the floor layer so we're going to get mask from floor. get the references to the animator, like that. that's just denoting the type of what we're looking for. In this case we're looking for an animator so we write . If we were looking for a rigidbody we'd write and so on. And that's all we need to do to setup the references. put a call to fixed update. that fires every physics update. Unity runs on a number of updates. The fixed update runs with physics. use fixed update to move him. we're going to get the raw input. a value of -1, 0 or 1. It won't have any variation in between those. Just so you know, an axis is actually input. as well as the left and right arrow keys. Either of those manipulate the horizontal axis. gives me a value of 1 in the horizontal axis. as well as the up and down arrows. or right control, so on and so forth. and that's where these axis exist and how we set them up. to do to get those. them within specifically fixed update. them within any of the functions in this script. called by Unity, they're mono-behaviour functions. that we can call within those fixed update and awake. in to movement, turning and animation. to keep them all modular. that we'll parse in to this function when we call it. so we're going to use H for it's X component. going to put that as 0. We're going to use an F because it's a floating point. X and Z are flat along the ground. will translate to lateral movement in the game. like a size of 1 for that vector. get an advantage by moving diagonally. What we want to do is normalise that. but it's going to make sure that the size is always 1.
regardless of which key combination you use. that by our speed variable that we stored. Also, this is called fixed update. DeltaTime is the time between each update call. it is going to move 6 units. apply that movement to the player. to a position in world space. to the position that the character currently is. to the player's position, the transform.position + movement. Again we're going to make a new function. This time we're going to call it Turning. We don't require any parameters for this. rather than the input that we've already stored. from the camera in to the scene. Let's have a little look at how that actually works first. the screen and the level plus the floor quad around the level. to the floor quad to get a particular position back. point of wherever the camera's looking. and another one in the wrong spot. up so that it is inside the class. we're going to create a ray. a ray coming from the camera. from that point forwards in to the scene. underneath the mouse if you imagine. if that hits the floor quad. so that's what we're creating here. cast the ray that we've created. so that it can hit something. So we're going to put that inside and If statement. so we'll just skip out of this function. That's what that little If at the start there is for. So we need to give this a number of parameters. positions and directions of the cast that we're going to have. so how far are we going to do this raycast for?. And that's the variable camRayLength that we store earlier. only trying to hit things on the floor layer. That's that floor mask that we created earlier. two closed braces at the end there. and then at the end we need to close both of those brackets again. player to where the mouse has hit. minus transform.position, that's the position of the player. of this vector is definitely 0.
a way of storing a rotation. is that the Z axis is their forward axis. the forward vector of the player. when we give it the playerToMouse. we're trying to give it a completely new rotation. we're going to look at the animation. or idle is dependent on the input. a boolean variable called Walking. or the V variable has some value. and we don't need to worry about it. it's true and the player is walking. is that not equal to 0? depending on whether it's 0 or not 0.
is V not equal to 0? If we pressed either of those we're walking. If we didn't we're not. so you'll remember we made a parameter called IsWalking. was a type bool, a boolean, true or false. And it was called IsWalking. calls to those functions that we've made. Currently they're just functions sitting there by themselves. actually being called an actually being used. exist and are waiting to happen. we already got the input, we stored that. we now need to call these functions that we've created. So we call them just by using their name. And then parsing in the values if they're required. and that's all that we need to do. and switch back to Unity. at the bottom of the screen in red. or W, A, S and D.
that in the next phase. So you should be able to move around. and run around this this. Okay so we're at the end of phase 2.
will make that camera work. public float speed = 6f;            // The speed that the player will move at. Vector3 movement;                   // The vector to store the direction of the player's movement. Animator anim;                      // Reference to the animator component. Rigidbody playerRigidbody;          // Reference to the player's rigidbody. int floorMask;                      // A layer mask so that a ray can be cast just at gameobjects on the floor layer. float camRayLength = 100f;          // The length of the ray from the camera into the scene. // Create a layer mask for the floor layer. // Store the input axes. // Move the player around the scene. // Turn the player to face the mouse cursor. // Set the movement vector based on the axis input. // Normalise the movement vector and make it proportional to the speed per second. // Move the player to it's current position plus the movement. // Create a ray from the mouse cursor on screen in the direction of the camera. // Create a RaycastHit variable to store information about what was hit by the ray. // Create a vector from the player to the point on the floor the raycast from the mouse hit. // Ensure the vector is entirely along the floor plane. // Create a quaternion (rotation) based on looking down the vector from the player to the mouse. // Set the player's rotation to this new rotation. // Create a boolean that is true if either of the input axes is non-zero. // Tell the animator whether or not the player is walking. var speed : float = 6f;            // The speed that the player will move at. private var movement : Vector3;                   // The vector to store the direction of the player's movement. private var anim : Animator;                      // Reference to the animator component. private var playerRigidbody : Rigidbody;          // Reference to the player's rigidbody. private var floorMask : int;                      // A layer mask so that a ray can be cast just at gameobjects on the floor layer. private var camRayLength : float = 100f;          // The length of the ray from the camera into the scene.